Jamie Oliver might laugh at me. But hey! Who cares?? At least I've tried and it was quite tasty. Anyway, thanks to Jamie for the great recipe. 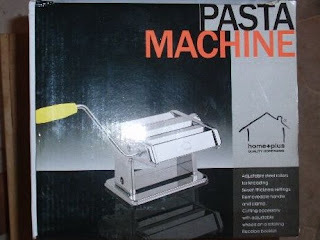 It's not that complicated anyway, but you must have pasta maker like this one. 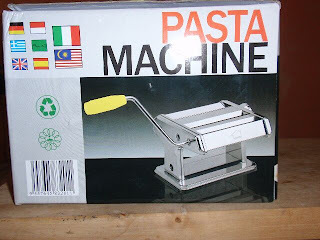 I bought this machine for RM50, and it's quite good. This is the result and taste really good. 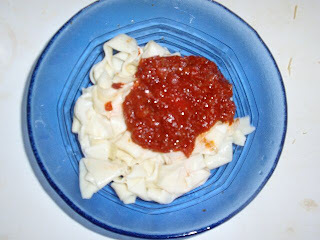 And FYI, I made the sauce myself, not out of bottle yaa.. hehehe..
Pars Hotel, this is where I stayed for almost 1 week. Not so bad, but location wise.. naaahh.. very bad, especially for tourists. Even lots of Bahrainis didn't know the location. One more thing, the breakfast also quite bad. My classmates with our instructors, Suresh and Jossy. I was supposed to fly back to KUL on Thursday night, and initially my flight was via Bangkok. A few days before my flight day, Florence messaged me, Suvarnabhumi Airport closed. Oh my God! I quickly changed my flight to Friday night directly to KL. Suresh helped me to get 1 more night at Pars Hotel. Basically on Friday morning I have nothing to do, so I just walked around my hotel area. This is the biggest mosque in Bahrain. Just 10 mins away from my hotel. I was so excited. I though I could finally go back home. I reached airport almost 3 hrs before departure, but I was denied boarding! Luckily I found another 3 gentlemen, heading to KL. One of the was our Cargo Manager, Mr Andy. And I was also lucky because they give us hotel to stay for another night plus boarding pass for the next flight. I stayed in Crowne Plaza, Manama. It's much much better than Pars Hotel. Again, I have another 1 day free. Nothing to do. Since, Crowne Plaza is in city center, I decided to walk around after breakfast. I didn't mind walking, because the weather was quite soothing, starting to get colder and I feel safer there as compared to KL. I walked slowly until I reached Bab Al Bahrain. It was quite a dicstance actually, but at least I was quite familiar with the area. Diplomatic Area, this is where Crowne Plaza located. Golden Tulip Hotel. I stayed there for my 1st and 2nd course in Bahrain. I prefer here than Pars.